I love a good chunky metal ring just as much as the next woman, but when it comes to necklaces and earrings, there isn't much I'd rather wear than a soft, gently textured textile. They warm up to your skin instantly, and the barely there weight means a giant statement piece won't leave you with a sore neck. Being immersed in the textile arts community, I'm lucky to be surrounded by opportunities for textile adornment. Here are some of my favorites... admittedly, the first two women are good friends and all around amazing humans. The last two I have not had the pleasure of meeting, but all these women share the experience of creating bodily adornment as part of their artistic expression. Gamma Folk's recent expansion into objects for the home invites mores sculptural elements to her latest collection, which when viewed in person has a intriguingly alien quality to it (see last image) but like, friendly aliens with warmth and beauty. While I love a good tassel earring forever and always, it's her Hera Earrings in bone that I have found myself reaching for at every occasion (and photo shoot!) and pretty much any time I want to feel as though my pajamas and my daily wear are distinctly different. 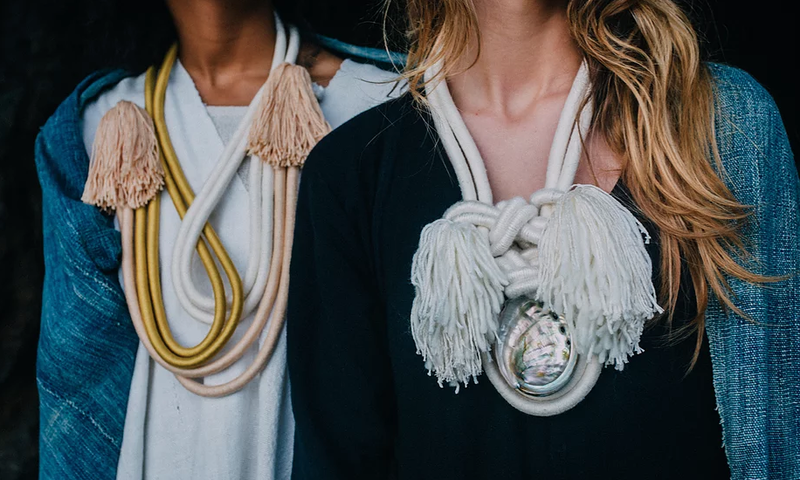 Lise Silva's wrapped cords are held together with Sacred Knots, a concept she has been diving into for many years. I grabbed a copy of her illustrated booklet Knot: A Book and 1. was amazed at how much information and inspiration it contained and 2. left with so much more of an appreciation for each of her pieces. Her work is developed using knots from many cultures and societies, from ancient China to the sailors of the last centuries. Her ability to so eloquently describe how the divine plays into her artistic methods leaves you with a silent appreciation for the act of making as a spiritual practice. The wearable pieces allow you to bask in this appreciation all day long. From her website: "She is interested in the energetic presence that jewelry possesses—it can give the wearer freedom, expression and power. Cloth has the ability to tell stories, hold memory and history. Mary’s collection strives to expand on this learned craft, but also blur the boundaries of traditional weaving." Her metalwork is also not to be missed... I was gifted a pair of Arc studs in a blackened silver, and they make me feel like a futuristic warrior queen. Also I tried on these earrings and "couldn't take them off" if you know what I mean... alas, my wallet gave zero sh!ts and so now I just dream of them every here and again. and again. and again.